Leeds City Transport Manager R.L. Horsefield designed the double deck tram which was to adopt his name. The trams were built by Brush between 1930 and 1932. Originally delivered with a trolley pole pick up arms mounted on the roof, these were replaced from 1938 with the improved Fischer bow collector system. The Horsefield trams remained in service with the Leeds City Tramway until the systems closer on the 7th November 1959. 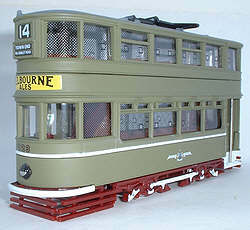 The Horsefield Tram model was originally designed as a exclusive promotional model for a Yorkshire Newspaper group, however the deal feel through in it's late stages, and Gilbow decided to go ahead and release the model in the standard EFE range. 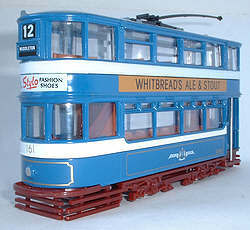 All the models released to date have been in Leeds City Transport / Tramway liveries. However several different colour schemes are available to be modeled. The Wartime and Road Safety models being two of the more eye catching versions. The first release of the bow collector version came in October 1991, followed 11 months later by the pole collector version. The first release came in two versions, the standard with black chassis, and a rare factory error version with brown chassis. The releases of models have been limited due to the nature of the subject with only 10 variations appearing in since it's introduction to the range, the last of these was released back in 1999.